US - The rubber-like elasticity of skin, which contracts to its original shape after being stretched, is key to the development of regularly spaced hairs and sweat glands during development, according to new research at the University of California, Berkeley. The findings, which come from experiments on how chicken skin generates feathers as the embryo develops inside the egg, could provide tips on how to grow artificial skin for grafts that looks like normal human skin, complete with hair follicles and sweat pores. Just the right tension on growing skin could set up these organized structures without the need to add chemicals to trigger them. The research is the first to link the gentle tug of war among cells as an organism grows to the specific genes that turn on to make cells differentiate into different cell types, turning a generic skin cell, for example, into a specialized follicle cell - and eventually a feather. "The cells of the skin in the embryo are pulling on each other and eventually pull one another into little piles that each go on to become a follicle," said embryologist Amy Shyer, a Miller postdoctoral fellow in the UC Berkeley Department of Molecular and Cell Biology. "What is really key is that there isn't a particular genetic programme that sets up this pattern. 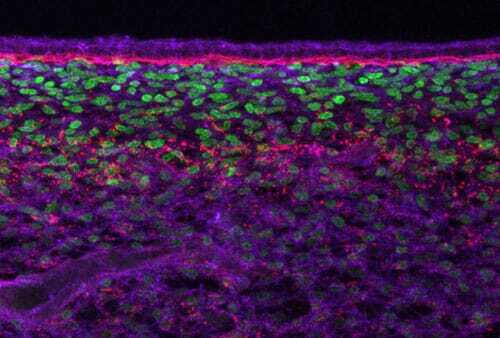 All of these cells are initially the same and they have the same genetic programme, but their mechanical behavior produces a difference in the piled-up cells that flips a switch, forming a pattern of follicles in the skin." Ms Shyer and Alan Rodrigues, an independent biologist and former UC Berkeley visiting scholar, are first authors of a paper about the findings published online 13 July by the journal Science. The research connects two schools of thought about how the intricate complexity of an organism arises. One is that the complete body plan of an organism is determined by a genetic programme that starts at conception and dictates each cell's destiny. The other, older idea is that interactions among cells and the things they grow on are key to determining their fate: in the skin, for example, whether they become a sweat gland cell or a hair cell, or remain a skin cell. "One of our key assertions is that the specification of this pattern is not directly encoded in the genome; there is no enhancer that is saying, you are going to become a follicle and you are not, which is how a lot of people often think about it," Mr Rodrigues said. Enhancers are short stretches of DNA upstream of a gene that regulate the gene's expression. In the study, Ms Shyer and Mr Rodrigues tested different types of materials on which to grow skin taken from week-old chicken eggs, using artificial substrates that mimic the stiffness of tissues that underlie the skin in the bird. Many of these materials were generated by graduate student Elena Kassianidou in the lab of Sanjay Kumar, a UC Berkeley professor of bioengineering who investigates the role of mechanical forces on the biology of cancer and stem cells. Both are co-authors of the study. When they transferred a piece of skin - the outer epidermis and the underlying dermis - to these materials, they found that when the cells in the dermis were able to pull strongly against the substrate, they tended to bunch up in numerous evenly spaced spots throughout the skin. These aggregates squeezed adjacent cells in the overlying epidermis, which activated genes in those cells that made them become a feather follicle. The result: an orderly array of follicles, just like in normal chickens. When the substrate material was too stiff or too soft for cells to push and pull against, the dermal cells all glommed together into one bunch, squeezing the epidermis to yield just one follicle. Within the ideal range of substrate stiffness, the stiffer materials produced more closely packed follicles, which could explain the fact that feathers are differently spaced on different parts of the chicken. "This resistance to the pulling force, called traction, is key for forming many aggregates, as it limits the distance the cells can move," Ms Shyer said. "Without the resistance, the cells would pull strongly on each other and freely move into one large aggregate." "The fundamental tension between cells wanting to cluster together and their boundary resisting them is what allows you to create a spaced array of patterns, in an emergent way," Mr Rodrigues added. The skin was obtained from chicken embryos at a time in their development analogous to about one month of gestation in humans, a point at which the human embryo looks the most like other animals, ranging from chickens and turtles to mice and humans, Ms Shyer said. This is also the point where the rough outlines of internal organs start to differentiate and look like, for example, a heart, lung or liver. "This suggests that the principles we've uncovered at this particular stage are highly conserved across all animals, and could be a basic mechanism," Mr Rodrigues said. The researchers also discovered that squeezing the epidermal cells jostled a protein, beta-catenin, which normally sits on the surface of the epidermal cell, making it relocate to the nucleus. There it flipped a switch that started the genetic programme to make each clump of cells differentiate into a feather follicle. In terms of application, Mr Rodrigues said, "We have gotten really good at taking stem cells and making them progress into different fates, but we are not good at controlling in a clean way how those cells organize into unique structures as they differentiate. They need to adopt the right fate, but also the right architecture. "Figuring out how to achieve the right fate and right architecture at the same time is something that embryos have already solved. We are presenting design principles that the embryo is using that could be used to rethink the way we do tissue engineering in a dish, specifically thinking about how the mechanics and the cell fate decisions are working together." A key contributor to the research, and the second author of the paper, was undergraduate Grant Schroeder, who in May won UC Berkeley's top honor for a graduating senior, the campus's University Medal. "His key experiments ... opened up a new topic area of exploration for us, which we used as the basis" for a $1 million National Institutes of Health grant, Ms Shyer wrote in a letter recommending Schroeder for the award.